My name is Miriam, and this is where I live. Hut 18, bed 22. It’s not often we come across a children’s picture book centring onWorld War 2, concentration camps and human suffering. Such a topic needs an exceptional balance of truth and sensitivity. The stunning partnership of Margaret Wild and Julie Vivas, in Let the Celebrations Begin, does just that. Over twenty years later, Let the Celebrations Begin continues to have an enormous impact. First published by Omnibus Booksin 1991, CBCA shortlisted in 1992, and re-released by Walker Books in 2013, Let the Celebrations Begin tells the story of young Miriam caught in a German concentration camp. The younger children have only known life within the cold camp walls. Miriam however, remembers her life, her parents, her very own bedroom and her very own toys. As the occupants of Hut 18 dream of freedom, Miriam and the women decide to secretly make their own toys - a doll, an owl, a patchwork elephant - in anticipation of the day the war will be over. They work together using bits and pieces; stray buttons, scraps of material, tiny strands of threads and anything else they can find. Margaret Wild’sinspiration for the story came from a book about antique stuffed toys, made by Polish women in Belsen, for the first children’s party held after liberation.The beautiful blend of text and illustration work harmoniously together, to make this an outstanding title. 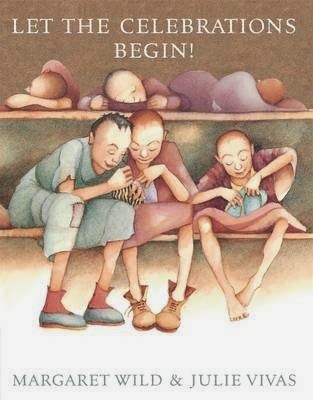 Julie Vivas’ unique and gentle style, her choice of colour; the shaved heads, thin bodies, the rags and oversized boots, depicts the overall suffering, without being harsh for the younger reader. Let the Celebrations Begin is certainly a courageous book, celebrating the triumph of the human spirit even in the most adverse conditions. There are teachers' notes available for this title.